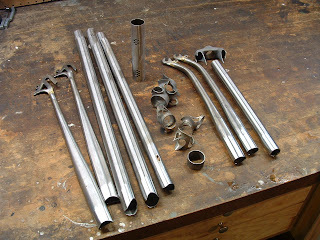 All the tubes and lugs cleaned and ready to braze. I used a set of old pressed lugs which came with triangular windows in the corners. I filled a bit of the window with brass and then cut the filigree. The lugs also had cutouts on that looked vaguely like hearts, so I just finished the jobs and made hearts. Here's the internal brake cable fitting after brazing. I get quite a few questions on how I do internals, so here's a couple shots. On the left I have one end ferrule which is already brazed onto the smaller internal tube that the cable will pass through. 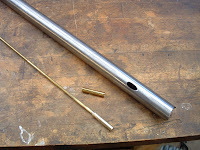 I've drilled and shaped the hole in the top tube for the ferrule and now I need to fit it to the length I need and braze the second ferrule on which I'm preparing to do in the photo on the right. 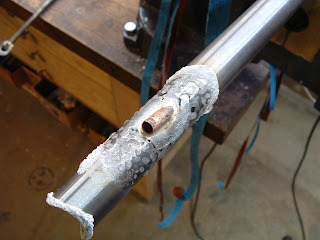 Once I have both ends brazed on, I fit it into the tube and do the final braze shown above. 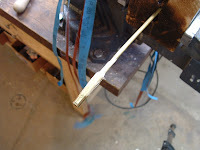 Once the flux is soaked off, I'll finish the protruding ferrule. 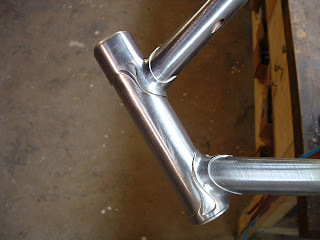 On this particular frame I choose to finish it flush with the tube, on other bikes I may use a different look. beautiful work Dave. 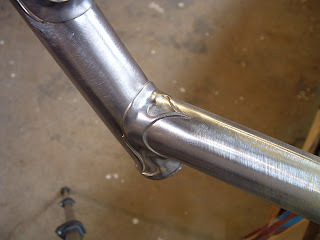 When you fill the lug corners with brass, is this done before the lug is silver brazed (it has to be)? How do you get the brass to sit on that small edge like that? !